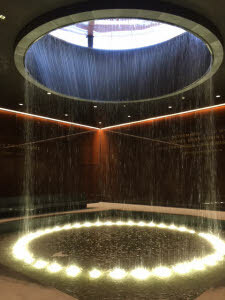 The African American Museum is the 19th Smithsonian museum in Washington, D.C. It is located on the National Mall near the Washington Monument. This intense interactive display describes about the Woolworth's lunch counter incident in Greensboro, N.C. 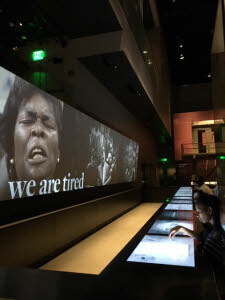 The museum which is a repository of everything African American charges no admission fees as part of the Smithsonian Museums is nevertheless “sold out” until next March (2017). Entrance is gained through timed entrance tickets dispersed online. New release dates haven’t been announced. Area locals and tourists can gain entry on a daily basis by lining up before the museum opens at 10 a.m., at which time a small number of those on line are admitted. “I did get on line at 9 a.m. The best way to understand this perilous and miserable journey to the United States is to start underground, two floors down from the museum’s entrance. As I rode the elevator down the glass window side permitted views of wall markings with descending dates back in history. It has been estimated that 12.5 million African men, women and children were enslaved and taken to the Americas over the course of 400 years. “It was the largest forced migration of human beings in world history,’’ according to the museum. This ground floor level explains how and why this migration came to be in basic but very visual displays. I learned many new things, such as the high status and culture experienced by many of the Africans before they were sold into slavery. Africa, prior to the mid-15th century was known as a continent comprised of diverse people, places and cultures. The continent included city-states, kingdoms and villages. The residents of those practiced different faith systems and had their own family and community traditions. One visitor, Katherine Gilmore, a new resident of D.C., was moved by the museum’s emphasis on the theme of resistance and resilience among the African Americans from the time of the slave trade to the present day. 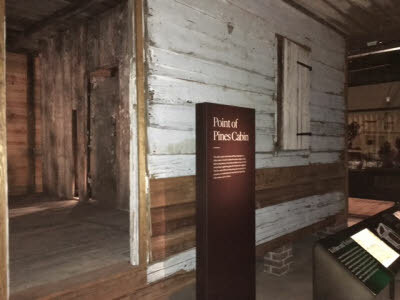 “I also liked the way the lowest level (of the museum) broke down how early slave owners constructed the concept of “blackness” and “whiteness” was used as a tool to separate the slaves from the indentured servants, added Ms. Gilmore. Ms. Gilmore’s friend, Sofi Hersher, also new to D.C., “walked away feeling simultaneously heartbroken and profoundly recommitted to the fight for racial justice.” . Africa was also rich in natural resources including gold. The continent traded in spices and ivory. This global trade had economic, political and social implications which are still visible today, according to museum information. As visitors “rise” to the upper floors the museum traces not only the history but the culture of African Americans. 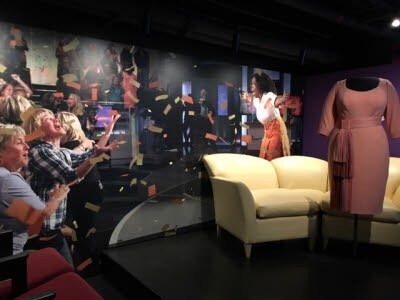 There are exhibits focusing on almost every aspect of life through the centuries, some of which had been well documented in other museums, history books, radio, television, plays and music. There are the Freedom Riders, civil rights activists who rode integrated interstate buses into the segregated southern United States. The March on Washington for jobs and freedom in August of 1963, took place on the very same National Mall. It was here that Dr. Martin Luther King Jr’s famous “I Have a Dream,” was delivered to the 300,000 people who attended this highpoint of the march. Other exhibits chronicle “Changing America,” 1968 and beyond which examines the social, economic and political history of the post-civil rights era. The feeling I came away with from these exhibits is the more things change, “the more they stay the same.’’ Some of the battles fought so bravely before for equal rights are once again being fought. 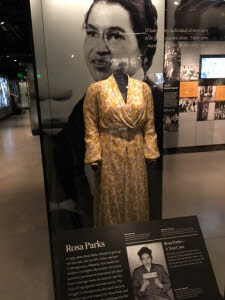 New artifacts within the museum include a dress made by Rosa Parks, a stool from Woolworth’s lunch counter in Greensboro, N.C. (the entire lunch counter display is especially moving according to many visitors) a hymnal that belonged to Harriet Tubman also is an eye catcher. Where this new museum excels is in presentation, graphics, displays and layout. You are propelled upward. With each floor rising to the top there is more color and brightness. There are the “game changers,” African Americans who were responsible for providing the “jazz” in several fields. Originating in New Orleans around 1900, “jazz” is a musical genre which incorporated rhythm and heavy use of improvisation in a variety of musical style, including swing, big band and bop. Not to mention blue notes. There was Sam Cooke, Dream Girls, Nat King Cole, Sammy Davis, Jr. and who could forget Beyonce and JayZ. Making names for themselves were athletes such as Jackie Robinson, Arthur Ashe, Jesse Owens, Wilma Rudolph, Muhammad Ali and Serena and Venus Williams. There are distinct cuisines developed among African Americans in different regions of our country based on their contact with foods and cooking techniques of the country in from which they came. And also given display are the Women of Color Quilters Network which helped document the traditions of quilt making. Along the Atlantic coast of southern South Carolina and northern Georgia the descendants of enslaved Africans have preserved a wide variety of very distinctive traditions from West Africa that have become known as Gullah Geechee. Today, many people collect Sweetgrass baskets, made from a combination of sweet grass, bulrush and pine needles and palm leaves. These prized baskets are some of best known pieces of African American folk art. Another prized collection of African American art, Mae Reeve hats, was on display and for sale in the museum’s extensive gift shop. This particular display seemed to be getting a lot of attention during my visit. Mae Reeve (born in 1913) is an African American entrepreneur and milliner who owned and operated a hat shop in West Philadelphia for more than 50 years. She established herself as a one-of-a-kind ladies hat maker, who is best known for her intricately designed “showstopper” hats. And the hats in the museum shop did their job, stopping women visitors who all seemed to want to try on one of the hats. 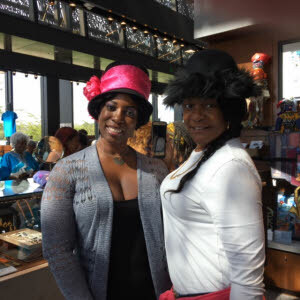 “I’d love to buy this hat (priced at $130) but since I have a son in college this will have to wait,”” said Darlene Clareth, who was visiting the museum that day with her friend Andrea Griffith. Both women said they loved the museum. 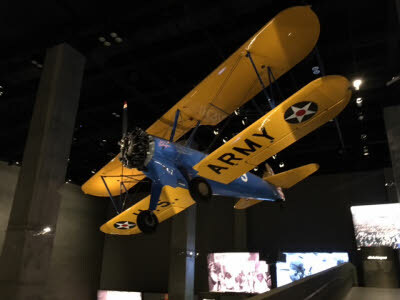 You can get a good overview of the museum within several hours, but to really see it and take in all it has to offer will take numerous visits. The museum exterior chronicles the rise of the culture. The museum’s tiered bronze exterior with perforated tiles resembles the ornate metalwork made by New Orleans slaves which decorated Southern mansions. One last thing not to be missed, on any visit, is the Sweet Home Café. The lines, around lunch, were long, but wait anyway, the food is that good and reasonably priced. There are raves for the buttermilk-fried chicken, cornbread and the Caribbean-style braised beef sandwich. It is set-up as self-serviced cafeteria style, with so many different areas and options. You then pick one of the long cafeteria style tables with open seats. Then while you eat, be sure to talk with your tablemates. You will not only learn their opinions about the museum, but maybe even make some new friends. The African American Museum is located at 14th Street and Constitution Avenue N.W. on the National Mall right near the Washington Monument. 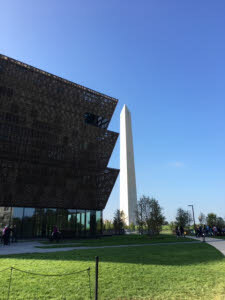 Web site: nmaahc.si.edu. (866) 297-4020. It is open every day all year, except Christmas Day. For any and all information about visiting the Nation’s Capital contact Destination DC the official destination marketing organization for Washington D.C. Web site: Washington.org (202) 789-7000. Free same-day passes are given on a first-come-first served basis to visitors who are in line at 9:15 a.m. Each person can get up to four same-day passes.